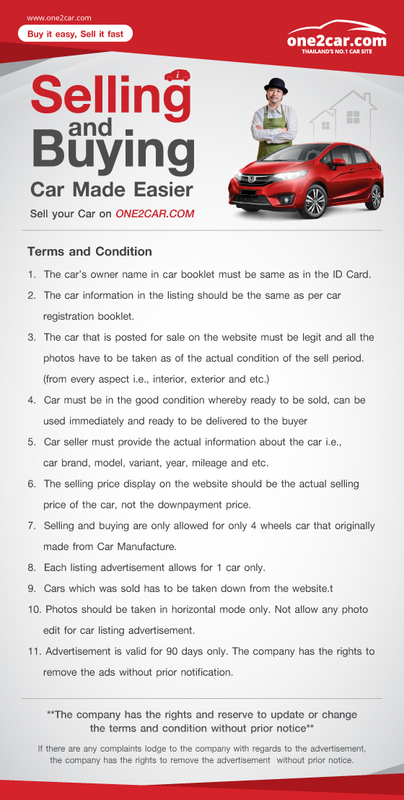 One2Car.com a website which enables easy selling and buying with more than 2.5 million car buyers waiting to buy your car. By choosing this package, you are able to upload up to 21 photos. In addition to this, photographer services* will be provided by us. The best of all, your ads will be on the 1st page every week. *Photographer services is within Bangkok and Chiang Mai only. You can increase the opportunity to sell your car by providing the description such as accident free, excellent service record and etc. You can upload 5-21 photos. A good quality car image will help you sell your car faster. Supported image file extensions are JPG and JPEG. Each image file must be between 10 KB but less than 12 MB. Uploading a copy of your vehicle registration will confirm that the vehicle information is true. Buyers will be able to view a copy of the vehicle registration. Please check your profile before uploading. Add ID Card Change Delete Please upload a copy of ID card. Supported image file extensions are .JPG, .JPEG, .PDF and .doc only. IC / Passport Number * Please enter your IC number / Passport number. You confirm that you will comply with the terms and conditions of Icar Asia (Thailand) Limited. Please select Please select model. Please select Please select year. Please select Automatic Manual Please select transmission. Engine (cc) * Please enter engine capacity.